In 2004, Senator Kay Bailey Hutchison succeeded in persuading Congress to designate El Camino Real, at least the Texas and Louisiana portions, a national historic corridor. We Texans, especially we East Texans, knew it all along. El Camino Real, or King's Highway, or Royal Road, designates an official thoroughfare, much as we would refer to I-20 or US 59 today. It began in 1690 when Alonzo DeLeon crossed Texas on a northeastern course previously untroubled by Europeans to establish Mission San Francisco de las Tejas near the Neches River so France would understand that the territory belonged to Spain. In 1691, Domingo Teran de los Rios used much the same route to bring supplies to the mission, which was abandoned in 1693. In 1714 the French began to threaten Spanish interests in East Texas, so Spaniard missionaries and presidio soldiers used the route to establish and sustain six missions until 1773. 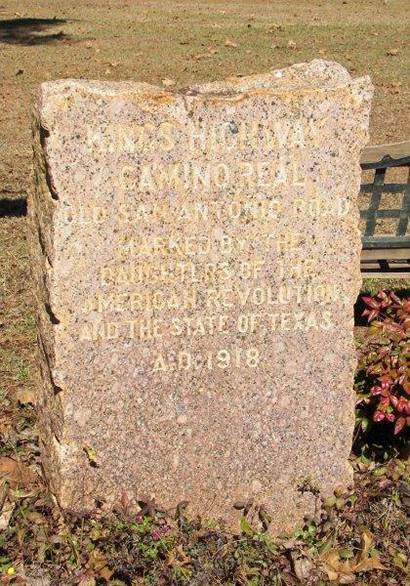 El Camino Real, by then also known as Old San Antonio Road, if still just a trail, could be called "established." Actually, Old San Antonio Road had many routes that came together at San Antonio and Nacogdoches, the only two population clusters along the 540-mile trace. Sometimes routes varied because of flooding or dangers from Indians, but they all focused on these settlements. Spain's thrust had been northeastward, but by the 1820s Anglo immigrants had reversed the predominant direction of the flow as they passed through Nacogdoches to new settlements further west. In 1915, our legislature wanted to honor the Old San Antonio Road, so they appropriated $5,000 so V.N. Zivley could conduct a survey and tell them its exact route. The Daughters of the American Revolution provided funds to erect pink granite markers, according to Zivley's designation. 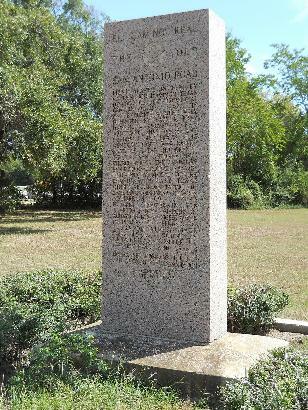 Marker for the Camino Real (King's Highway) that passes through Milam. 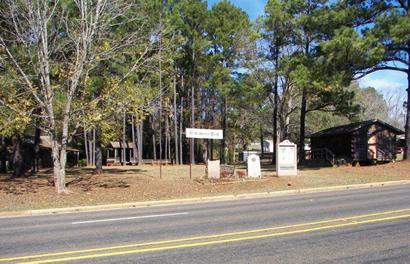 "The marker is on SH 21 (OSR) just west of SH 39 in Normangee. It is on the south side of the road." In 1989, a subsequent legislature created the Old San Antonio Road Commission to commemorate the 300th anniversary of the founding of the road, and for some reason Governor William P. Clements asked me to serve on it. I can immodestly say that Senator Hutchison completed, as only she could do, that for which we worked a decade and half ago. And this: that blamed Commission just laughed at me when I moved that we change the road's name to the Old Nacogdoches Road because San Antonio was only a stop over on the way to Nacogdoches. "If you're into road trips, take a drive down East Texas' oldest highway. The King's Highway (Texas 21) stretches from Toledo Bend Reservoir near Milam to San Antonio. It is also one of our most scenic roadways. The route was used by Indians and traveled by Spanish missionaries in 1791. It is also known as El Camino Real, the Old Spanish Trail, and the Old San Antonio Road."